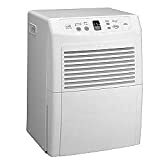 70 pint dehumidifier with auto-restart and automatic Humidistat control/energy timer. Front-removable bucket and bucket-full indicator, plus automatic defrost control and external drain connector. Energy Star? compliant Washable air filter Bucket full indicator lamp Auto restart in case of power failure External drain connector with rotary compressor Touch-pad button fan-speed selection Item Weight 49.0 lbs. Power & Ratings: Amps 8.4 Watts 860 Performance Features: No. of Fan Speeds 2 Air Flow 131 CFM (High) Bucket Capacity 22.0 Pints Pints per 24 Hrs. 70 pints/24 hr. Controls: Control Type(s) Electronic touch Sensor(s) Humidity Quality Features: Compressor Type Rotary Enhancements Humidity control Manueverability 4 casters Safety Bucket full shut-off Color: Overall White Dimensions: Cabinet Depth 13-3/8 in. Cabinet Height 21-1/4 in. Cabinet Width 15-5/32 in.